Selenium is an automation tool for browser behavior. It automates browsers. Selenium IDE (Integrated Development Environment) is a prototyping tool for building test scripts. 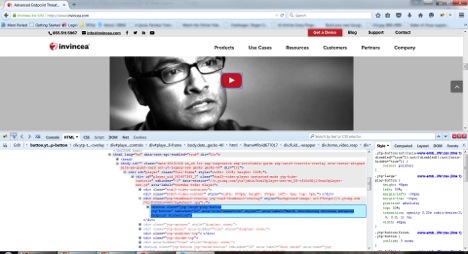 It is a Firefox plugin and provides an easy-to-use interface for developing automated tests. 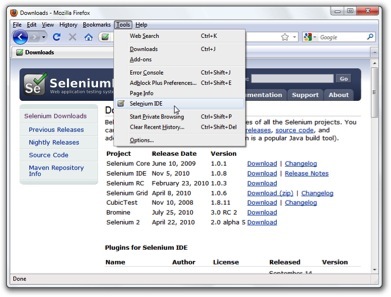 Selenium IDE has a recording feature, which records user actions as they are performed and then exports them as a reusable script in one of many programming languages that can later be executed. Selenium WebDriver makes direct calls to the browser using each browser’s native support for automation. The browser chosen determines how these direct calls are made and the features they support. You can use the Selenium WebDriver APO implementation in any specific browser for integration in your specific automation project programming language and structure. 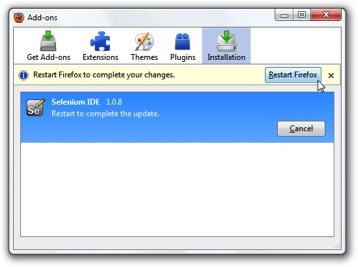 The Selenium IDE is available only for Firefox. It is an easy-to-use Firefox plugin and is generally the most efficient way to develop test case scenarios. Its intended purpose is mainly easy automation for people who don’t use or don’t want to use programming languages. 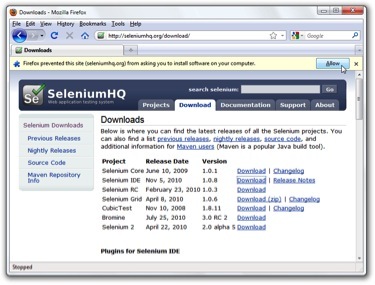 However, it doesn’t give you access to all of the power of the Selenium implementation. If you want all of the power that’s under the hood, you should use Selenium WebDriver in your favorite programming language. The Selenium WebDriver makes direct calls to the browser using each browser’s native support for automation. There is a specific driver available for each of the supported browsers, mainly Firefox, Internet Explorer, and Chrome, though it also includes Opera. It provides an API that can be used for easy integration into your automation project. Its main intended purpose is automation and it gives you complete power over all of the capabilities of the Selenium WebDriver implementation. The Python bindings for Selenium provide easy access to all of the functionalities offered by Selenium WebDrive from Python. The current supported Python version are 2.7, 3.2, 3.3, and 3.4. 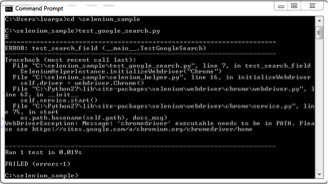 Now you can use the WebDriver to created automated test cases in Python. 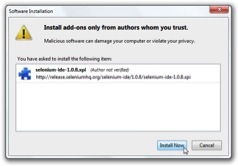 Just pop a .py file on your driver and from Selenium, import WebDriver. The Firefox WebDriver is available by default. If you want to use another browser, like Chrome, you need to download the appropriate driver from the driver maintainer (in this case, the Chromium project, which is available here) and add it to a known location. For example, include the path to ChromeDriver when instantiating webdriver.Chrome in your PATH environment variable. driver = webdriver.Chrome('/path/to/chromedriver')  # Optional argument, if not specified will search path. Let’s see if you can search on Google if you type something in the search box and press ENTER. I know this seems like a stupid example, but let’s use it to keep things simple. As you will see on your machine, Firefox will start up and SeleniumHelper will execute the navigation, input the text into the search field, and wait for the page title to change. All of that is found inside the selenium_helper.py file. Let’s run it for Chrome. Open test_google_search.py and replace the “Firefox” string with “Chrome” and then run it again. Oops! We need to get the driver for Chrome. Well, Selenium is nice and gives us a link to it. We will download the chromedriver_win32.zip, but you can download the one suitable for your platform. Unpacking the archive leaves me with a file called chromedriver.exe. If you want to be quick, just copy it next to our Python file and run the test_google_search.py. Voila! Chrome opens and runs the test case. It’s as easy as that. Updating is also easy–just overwrite the file with the new version. Want everyone to work with the same version? Push it into your repository and let the other people pull it to their machines or the test machine. 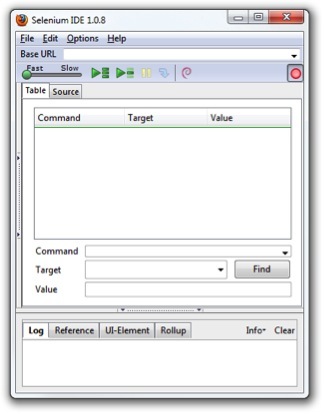 The element selection from the UI was done using XPath location. XPath enables the usage of path notation – like in URLS – to navigate inside the structure of the webpage. An element can be located either by using the absolute path or a relative path. The absolute path has to include all of the hierarchy above the selected element, which is prone to instability when the webpage is changed, as was the base with our “baby” web interface. So, naturally, a relative path was chosen. In order to select the needed element, a combination of XPath operators and attributes has to be used. You can see the blue border around the selected element and corresponding HTML code. This is the simplest way to select the button, but you have to be careful so that no other element in the page as the same @class. IF there are other elements with the same class, the first one in descending order will be returned. You might get lucky and the first one could be the one you’re looking for, meaning that when you run the test it’s going to work. However, as soon as another element with the same class is introduced before this one, the script will no longer return the intended one. So let’s make it a little more direct. Notice the added @aria-label? We have one extra property with which we make even more sure that the returned element is the button we expected. See how easy it is to use absolute path? Remember when we said at the beginning that we didn’t use this because it’s prone to instability? Well, it’s also very long! And imagine adding one element in the page somewhere before this button. You’ll have to rewrite all of the XPath. Notice the way in which, in the first two examples, at the beginning of the XPath we used “//” and in the third one we used “/”? The difference between them is that “/” starts the selection from the root node, while “//” starts the selection from the first node that matches the XPath. You can also use “.” to select the current node and “..” to select the parent of the current node. Play around using all of the attributes in the HTML code using the @ selector in front of them (e.g. @type, @data, @class, or @id). How about not only selecting the button but also clicking it? Selenium allows us to do this by adding .click to the end of the element selection code. So the above example will become driver.find_elements_by_xpath( "//button[contains(text(),\"Save\")]").click Beautiful, no? There are a few more ways to use XPath, which are easy to figure out on your own. The choice for Python and Selenium came after some time dedicated to research. Python was the obvious language choice because it was already used in the automation of sister Windows application tests. The question was what test tool to use for the interaction with the web interface. The choice came down to Selenium and Sikuli. Selenium won because the web interface we’re using is still in its starting period, meaning it’s subject to many UI changes against which Selenium is more resilient. Thanks for your time and I hope all of this will be of help! Lorand Varga is a Software Engineer at 3Pillar Global. He specializes in performance optimization, reliability improvement, stabilization improvement for client testing framework, and GUI automation. He mainly works in the Python language and with the following tools and frameworks: Jira, PyDev, Image recognition tools, Autoit, and Win32. Prior to joining 3Pillar, Lorand was a Software Engineer for Autoliv. I came your post while searching regarding selenium. I have a kind of “best practices” question. My company uses a browser based tools to do some activity. I used selenium(python) to automate all the tasks that are being done on that portal manually. Do you think this is technically wrong ? Are there any security issues if I’m controlling the browser through selenium? Please do let me know as per your convenience. I am new to Selenium with Python. Here, webdriver is a module? And is Firefox a class defined inside webdriver.py? If so how can I view the source for webdriver.py?